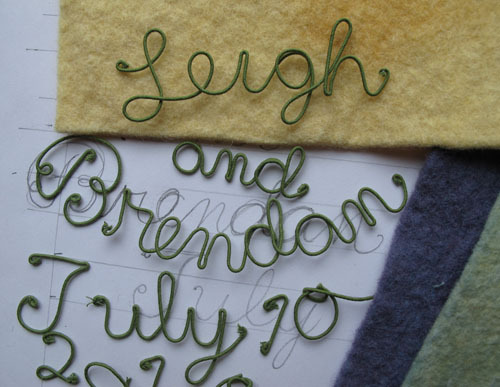 The 2nd summer wedding is coming up soon, so I’m making another felt banner for Leigh and Brendan (see Karen & Graham’s on an earlier post here). I get the impression that the bride and groom are kind of traditional, so I’m resisting the temptation to go wild with color and add too many funky embellishments. I started by bending 32 gauge cloth-covered wire to form the names and wedding date. I’m really having fun bringing language into my artwork this way. I started figuring out this technique a few years ago when I was working on Pocketful of Posies, and have no idea if the same kind of thing has been done before. Once you get into the rhythm, the wrapping goes quite fast. After all those years wrapping fuzzy pipe cleaners with embroidery floss for fairy limbs, this seems easy. I had to put in some color, though and wrapped the wire names in bright pink variegated embroidery floss. The couple’s invitation had a seaside motif, so I added a metal shell charm and got out a dried star fish from my collection of found objects. The dark blue and had too much weight compared to the names, so I lightened it by winding around a single strand of pink floss. After bending and wrapping the characters for the date, I cut out a piece of yellow felt to mount them on. I don’t make patterns and plan everything out ahead of time, but construct as I go. I always start with the lettering and then figure out later how much room they’re going to need. I decided to incorporate a more conventional floral decoration and added some of Mimi’s Kirchner’s felt roses and some glass leaf beads. If you haven’t learned how to make them yet, go to her tutorial on her blog here. I also got out the dreaded glue because that was the only way to attach some shells around the date. The yellow felt piece called out for some embellishment, so I added a chain-stitched loopy line around it. Then, I cut out a banner of blue felt, with scallops on the bottom and blanket stitched all around with variegated pima cotton from the Caron Collection. I found an old shell necklace, the souvenir kind from Hawaii, and sewed some shells to the scalloped bottom edge. I was glad that they already had holes. I sewed a casing for a drift wood stick at the top, then tied and braided a pima cotton strap. Here’s the finished banner, ready to wrap up and bring to the wedding. This entry was posted in Fabric Relief, Felt, Found Objects, Gift, my design productions, Sculpture, Tutorial, wedding banners by Salley Mavor. Bookmark the permalink. Very clever idea and will be a treasured keepsake. I love your wedding banners, Salley! What lucky couples the recipients are. I’ve been using cloth covered wire in my work from the beginning and find it to be so versatile — a truly nifty addition to the bag of tricks! I haven’t tried wrapping it, however. I gesso and then paint the wire to achieve the desired color before stitching it in place. Thanks for sharing your technique. Susan, thanks for describing how you use cloth covered wire- another variation worth exploring! So lovely! The bride and groom will love it. It really captures the feeling of a summer day in July! It will warm them in winter for years to come! Lucky couple to get this – I’m sure it will be a treasured keepsake. I just love the wrapped wire technique! What a wonderful wedding gift…so personal and special! Love to hear how you make decisions in creating your art pieces. Love your thread wrapped wire wording. Do you use the entire 6 strands of floss to wrap the wire or just a few? The fabric wrie you use- is this the same as florist wrapped wires? I am going to look at AC Moore for the wire. I have loads of floss becasue I cross stitch. Your work is wonderful and so detailed- thanks for new ideas to test my brain. Thanks, Denise, I hope you enjoy working with your threads. Yes, I use florist wire and usually wrap with 2 or 3 strands of floss.